Injury happens to almost all circus artists at some point in our training or career — and it’s important we learn to care for our spirits, not just our bodies, when injury strikes. Limitations can be a recipe for discouragement, frustration, isolation, and depression. But limitations can also be a source of inspiration and discovery. Below are a few stories of the latter sort, from some determinedly adaptable acrobats I know through my coaching at NECCA. To share and celebrate experiences like this, there’s the #adaptableacrobat tag — so keep reading for some thoughts on ways we can support and encourage each other during all the challenges we circus artists face in our training. It was hard to tell that Victoria Quine created her Pro-Track trapeze act at NECCA while unable to use her left wrist, but she says the limitation “ended up feeding the aesthetic of my piece: being asymmetrical on a very symmetrical apparatus.” While choreographing her trapeze act with only one hand, Victoria also continued to show up for the rest of her multidisciplinary circus training, even learning one-handed handsprings. “I realized I could prove what I’m made of even when not at my best,” she says. I had a wrist injury over the past year and was surprisingly delighted to create a trapeze act in which I never used that hand to hold the bar or ropes. I love the creative challenge of adaptive requirements; during this time I featured some of my solutions in a YouTube video, “Handstand Conditioning That Rests Your Wrists,” and in Instagram videos of hands-free aerial conditioning (1, 2). When I spent a month in a wrist cast that completely prevented use of that hand, sharing daily training discoveries on Instagram gave me motivation to keep working and innovating, and the positive feedback helped displace some of my frustration over my limitations. Around that time, my friend Allison McDermott asked if I was interested in helping develop an Internet resource to connect and inspire folks who are finding creative ways to stay involved in circus training without aggravating injury. As a first step in this direction, we conceived of the hashtag #adaptableacrobat. It’s not in widespread use yet — hence this blog post! — but search for it on Instagram and you’ll see a handful of folks training in spite of a cast, a boot, amputation, or simply a hand that needs a rest. Many of these posts are collected in our @adaptableacrobat repost account. One of my fantasies is to create a catalog where a person with a body part out of commission can find the workarounds other circus artists have developed for that same condition. “I can’t do toe hangs today, because I have a bruise on my foot,” a student told her teacher, a friend of mine, halfway across the country from me. “Oh, you should still do them, just place your foot in a different spot from usual. It’ll be good training for single toe hangs,” the teacher replied. Ingenious adaptations to physical limitation are well-suited to Instagram, and that’s been our #adaptableacrobat focus thus far. But my ultimate hope is that we can create a resource and community for anyone who identifies (even part of the time) as an aerialist, acrobat, or circus artist and wants to share something in which they are feeling good in their bodies, feeling inspired and engaged, and/or finding a way to safely participate in this art form they love — in spite of, or in relationship to, any kind of physical, emotional, mental, or logistical condition that they have to accommodate or take into consideration. And while most of the thoughts in this post come from my personal perspective as someone who at times can’t train the way she’s used to and has adapted to changes in her body’s abilities (with a baseline or past experience of able-bodied-ness), I also want to welcome circus artists who have worked adaptively from the very beginning of their training, and I don’t in any way want to exclude those experiences. 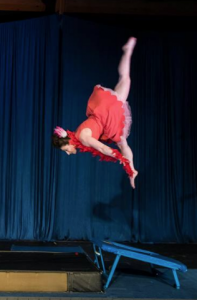 Depression, anxiety, diabetes, pregnancy, parenthood, and lack of access to a circus training space are all examples of situations that could lead someone to give up — so I want to applaud and celebrate any adaptation anyone finds to work with or around their challenging or unusual situation. Allowing yourself to go easy on your training (but still putting in time in the studio!) because your chronic health condition is acting up doesn’t always make for an Instagram video you’re proud to share — but if you do post a photo or video, tag it and we can cheer you on, with no pressure to be amazing by anyone else’s standards. And since not all these stories and victories are best suited to a visual format, what other ways can we use to connect circus artists around the world, and to share their stories and experiences? Allison and I are thinking of creating a Facebook page where we can post written word — perhaps later upgrading to a blog or website. We’d like to share written essays not just about the success, but also the struggle. We’d love to hear your ideas for creating community. 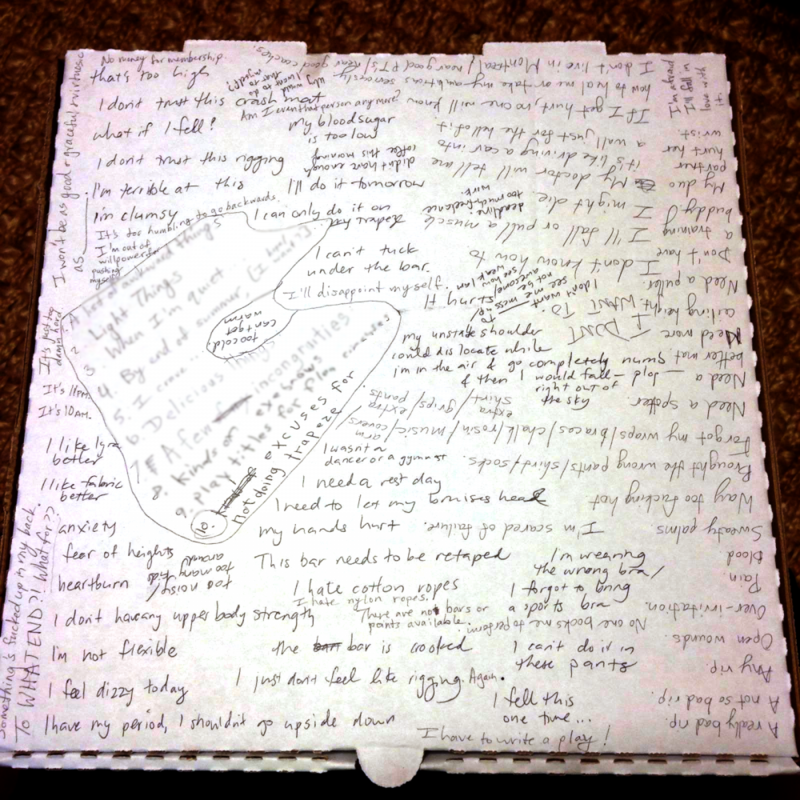 Lauren Feldman and I covered the top of a pizza box with excuses we’ve given or heard for not doing trapeze. Anytime we overcome them is worthy of celebration! But humor and camaraderie can be even more vital than getting on the trapeze every day. Finally, while I want to celebrate adaptability and the challenges and ingenuity that accompany it — I also understand that it is not the right course in every situation. Training circus with a healing body part puts it at risk; you may fall onto it or use it to save yourself when a move goes wrong. Training while in pain can create more pain. And working without using one part of your body can mean that other muscles and joints pick up the slack, putting them in danger of additional injury. Meanwhile, sometimes you may not have the resources (emotional, mental, time, energy) to adapt your training to your current situation. Or maybe you don’t want to adapt; you are genuinely more interested in motherhood, for example. Or your adaptation is to focus on other art forms: take ballet rather than circus classes for a while, or blog about circus, or make visual art. Or maybe the best decision for your heart is to stay away from circus arts until you can participate the way your heart yearns to. All these things are okay too; they don’t make you less of an acrobat. I want everybody to feel good about taking care of themselves in whatever way is right in any moment, whether self-care means taking a break and retreating, or staying physically involved and adapting. And if you share something on social media of yourself adapting your training — in any way, in any format, for any reason — so that you can still participate in your passion, tag and celebrate it.